Most towns have a ring road. It's something that brings great improvements to the local road network while not being too difficult to provide: there's no messy urban road building, just threading a road around the outside or, for a really cheap job, along wide suburban streets. Croydon didn't have that luxury. Already buried in the continuous sprawl of South London, any new road had to push its way through the houses. The proposed ring road was more of a box. On the east side, Wellesley Road and the Croydon Underpass were to travel non-stop from Station Road to Barclay Road. To the south, the road was to be elevated across the Wandle valley from Barclay Road to Duppas Hill. In the west, Old Town and Mitcham Road were to be linked by a new railway bridge to create a link from Duppas Hill to Derby Road. And in the north, another underpass would complete the circuit from Derby Road to Station Road. The Ring Road was part of the County Borough of Croydon's post-war utopia. At the beginning of the fifties, the town was already one of the key commercial centres in the vast urban smudge of South London, and its leaders planned to exploit that lead to the full. They envisioned sweeping away much of the dreary, smoke-stained Victorian town centre and replacing it with roomy boulevards, gleaming towers and cosmopolitan plazas. "It is proposed to construct an underpass or bridge across George Street carrying traffic from Wellesley Road into Park Lane." In fact the Plan contained every single new road that was built in Croydon right up to the present day, along with quite a few that weren't. While it didn't mention the words "ring road" anywhere, it did describe various road schemes that would link together to form a circuit of the town centre. The one above was, of course, the Croydon Underpass, which opened in 1965, along with the associated widening of Wellesley Road to dual carriageway. This formed the first part of the ring road dream. In those days there was little experience of urban road building, and the design practice was for broad new dual carriageways at ground level with new office and commercial buildings down each side. Smallbrook Queensway, the first part of the Birmingham Inner Ring Road, is incredibly similar to Wellesley Road in this respect. The idea of any sort of grade separation in a town centre was relatively new, and at first, the underpass was only going to be single carriageway (shown right; click to enlarge). It was later revised to a dual carriageway layout before construction started. The main road in to Croydon from London was supposed to be diverted across the railway at West Croydon station to meet a new gyratory at the northern end of the widened Wellesley Road, with a new West Croydon bus station provided in the middle of the junction. This proposal was put on hold in the mid-1950s on the advice of the Ministry of Transport, who thought a more elegant solution could be found. 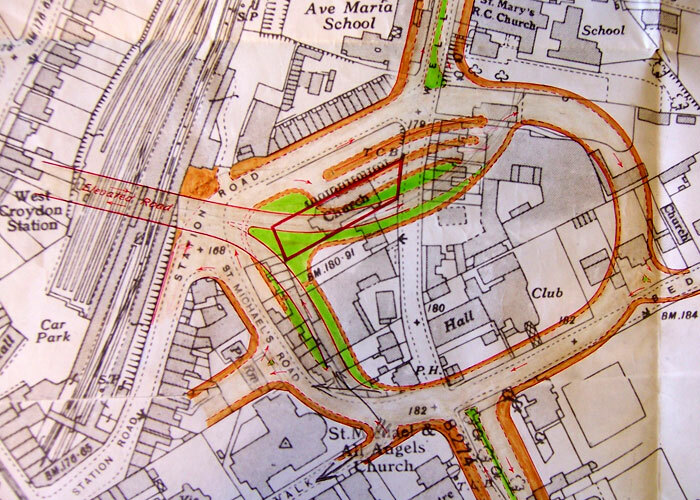 As a result, Wellesley Road was made to temporarily narrow back down to a single-carriageway road at its northern end instead of having a proper terminal junction - an arrangement supposed to be swept away when the northern side of the Ring Road opened, but which still exists today. By 1965 the first part of the Ring Road was finished, and it was time to look above ground, not below it. Construction work started on the southern side of the Ring Road almost as soon as the concrete of the Underpass had set. Documents referring to this part of the route keenly described it as the Inner Ring Road Stage 2 (A), though as no other documents from the time have turned up, it's impossible to say whether they were also dreaming of an outer ring road or what Stage 2 (B) might have been. In any case, Stage 2 (A) was concerned with "Construction of a Flyover together with ancillary roadworks and structures between Friends Road & Duppas Hill". Elusive documentation referring to the "Inner Ring Road"
While it formed part of the Ring Road, the Flyover had a dual purpose: it was also part of the designated East-West Route across the borough. The A232 follows this route (today it's the only primary route that comes close to Croydon town centre) and this is why the Flyover carries traffic right across the Duppas Hill Roundabout and away to the west instead of taking the more obvious course on to the west side of the Ring Road. "It has already been recognised that relative to the capacity of the east/west flyover and the Park Lane [Croydon] Underpass the roundabout will be a bottleneck, and this would be one of the junctions where Croydon would like to construct a 'car underpass' with sub-standard headroom and 1 in 10 ramps." "In one sliproad section, no less than eight faults had occurred in one element. It was thought that the faults were due, in the main, to the contractors' negligence in observing the basic precautions for the installation of the heating cables in the carriageway." Unfortunately the files don't document the conclusion of this saga, but the outlook was so gloomy in the weeks before the road opened that it would not be surprising if the system was never put in to use at all. The new road opened towards the end of 1968, bringing Croydon two sides of a Ring Road to go with an array of sparkling new towers and a new civic centre near the Barclay Road roundabout. The third part of Croydon's orbital dream was to link Duppas Hill Roundabout, in the shadow of the new Flyover (left), to the Mitcham Road heading away to the north-west. The first section of this road was widened to a dual carriageway in the 1960s, but before it could progress any further the railway line between West Croydon and Sutton had to be crossed. The solution was a new flyover - long enough not just to bridge the railway itself, but a local road on each side as well, so that the new flyover could cross them all in the same jump and provide a grade-separated junction north and south of the tracks. Unfortunately the other barrier to progress was the continuous early 20th century housing that stretched right across from Croydon town centre to Wandle Park. The Ring Road had to bulldoze a line through it. The new flyover - six lanes wide in total, wider than the roads it connected at each end - was forced through at rooftop level. After two years of noise and dust from the construction works, the huge concrete eyesore now facing residents on Cuthbert Road and Pitlake was likened to the Berlin Wall for the way it scythed through a previously quiet and close-knit community. At its northern end, awaiting the north side of the Ring Road, the Roman Way flyover came back down to ground level and narrowed very suddenly from three lanes each way to one as it reverted to the original suburban line of Mitcham Road. Opened in the late 1970s, the new route along Old Town, Roman Way and Mitcham Road formed the west side of the Ring Road, leaving just one part missing - the part that, vitally, would meet the main approach from London and relieve the northern end of the shopping area. Unfortunately, the cavalier attitude of planners in the 1950s and 1960s was to be the downfall of the Ring Road. Roman Way had gone most of the way to destroying what was left of the oldest part of the town, The Croydon Flyover having already sliced the southern part away. The outcry during its construction and after its opening was unmistakeable. Croydon's residents made it clear that they did not want any more carelessly-aligned dual carriageways carving up their town centre, however many plans their Council may have drawn up (shown left). It's a shame - though perfectly understandable - that the Council was so afraid to continue. From the little evidence available, the north side of the Ring would have been the shortest and the least intrusive. It would also have saved the area at the top of the High Street, next to West Croydon station, from becoming a congested and utterly unpleasant place to go shopping. Despite being next to a key railway station and the town's main bus station, it remains a scruffy area full of discount shops because few customers wish to spend any time there. Plans drawn up and published in 1974 show the northern side of the ring as a simple widening job on existing roads. In the west it would begin at a new signalised T-junction north of the Roman Way flyover, then run along the line of Dennett Road and Addington Road to meet the A232 London Road. A long underpass would carry the Ring Road beneath here, with an exit in both directions to access London Road, but an entrance only from London Road southbound to the Ring Road eastbound, which would merge inside the tunnel. It was then to run along the line of St James's Road to a new large roundabout on the site of the odd gyratory at the north end of Wellesley Road. As it stands, the two trailing ends of the would-be Ring Road both see a broad, fast dual carriageway funnelled directly in to a narrow suburban street, with little relief for nearby residents and one of the busiest approaches to Croydon town centre missing out on any sort of road improvement whatsoever. The whole Ring Road has turned out to be something of a joke. In the space of twenty years, Croydon sank millions of pounds into the demolition of swathes of Victorian buildings, leafy residential streets and some of its most historic areas; it built an underpass with integrated underground parking; it bridged an entire valley with a kilometre of elevated roadway; and severed a community with the biggest, widest road in South London. Yet somehow, driving the Ring Road today is a painfully slow, difficult experience that involves the negotiation of nine sets of traffic lights and two roundabouts. Not a single road sign or map refers to it as a ring road. For all the effort that went in to building it that simply doesn't make sense. And to top it all, key parts of the town centre are still plagued with traffic congestion. Town planners take note. There is nothing wrong with grand plans and ideas, and redevelopment is nothing to be afraid of. It should not be completely out of the question to build new urban roads if they are truly needed, which Croydon's were. This is not about leaving everything as it is and shying away from bold redevelopment. Well, to just not do this. With thanks to Paul Rowntree for information on this page, and for kindly providing the diagrams of the Ring Road as a whole and the proposed northern side.